On Monday, my dear friend Mary died. Though she’d survived the cancer she had in her thirties, the cancer she was diagnosed with in her forties proved to be incurable. Monday morning, she passed quietly on to her new life. And all of her family and friends are struggling with a new life, too — one that is a lot less bright without Mary in it. I’m going to try to capture her spirit here, because I want people to know about it. I’ll start by saying that Mary was one of the most generous souls I know. She was a huge heart that welcomed everyone. She loved the children she taught, many of them immigrants, and they loved her. I remember her telling me about the ICE raids in that community a few years ago, and the pain she felt for those kids who lived in such constant fear of a knock on the door. Last summer, she showed me pictures of her students, telling me all about them, and her affection was palpable: “Look at him. He’s such a character. Look at her. She’s so smart and so beautiful.” Student after student, Mary saw the unique and precious individuals that are too often lumped together under the category of Other. They were not Other to Mary. They were Us. One of the readings that she and her husband Tom chose for their wedding was Hebrews 13. Part of it goes, “Do not neglect hospitality, for through it some have unknowingly entertained angels.” At the time, I remember thinking that that reading captured Mary’s spirituality in a way that no other reading could. She saw angels in everyone, with a clarity of vision that inspires me. 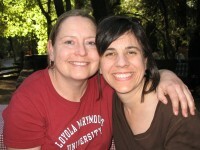 In her wedding, she wrote a special intention for gay, lesbian, and transgender Catholics, praying that they would always feel welcomed by the Church. She felt so strongly that no one is excluded from the love of God, and that we are most like God when we show that love here on earth. Mary was full of life. She was invariably late to every get-together, because she would cram so many things into her day. She adored good wine, rich coffee, camping trips, laughing, folk art, travel, farmers’ markets, and gardening. She loved kids — her nieces and nephews, her godkids, including my son Matthew. She was able to listen to kids, really listen. Seeing her with my sons, I caught a glimpse of how marvelous a teacher she was. And Mary had a gift for connecting. So many times, when I was with her in a shop or a restaurant, she would make some comment to the clerk or the waitress: a little compliment on their earrings, a question, or an observation that let them know that she was seeing them as a human being, not just as someone to facilitate a transaction. I’ve seen clerks and waitresses go from frazzled and surly to smiling in Mary’s presence. She saw their humanity, in every case, and she responded to it. It was not forced; I don’t think it was even conscious on her part. It was who Mary was. It was why we all loved her. It is why we miss her terribly. In October, I had a phone conversation with Mary, and it was that conversation that made me realize, with terrible clarity, that she was dying. Afterwards, I went into the kitchen and cried. It was so unfair, so terribly unfair, that someone like her would die so young. Why does it have to be Mary? Why can’t it be some mean selfish person instead? I asked God. And then I thought about how if the purpose of life is to learn to love as God does, then Mary doesn’t really have anything more to learn. She’s been loving like God for years. What’s painful is that there are many of us who need to learn that kind of love. I wish she were still here to teach us. The grief is coming in and out for me, in waves, which I know is normal. Some moments are very very bad. Last night I was thinking about how I would never again hear her greet me with her cheerful and melodic, “Hi, Ginnyums!”, and that realization hurt with a physical pain. But I find myself thinking back to a conversation I had with Mary years ago. It was a few months before her wedding, and we were in her car, driving through San Francisco on some errand. She was telling me about how excited she was about the wedding, but how she had random moments when she realized that if anything were to happen to Tom, she would be devastated. “It is hard to love someone so much and to think about how you might lose them someday, ” she said, getting emotional. Vaya con Dios, sweet and wonderful Mary. I love you like crazy, and I always will. Oh Mary, I do not know what to say. My prayers of rest and peace eternal for Mary, held so deeply now in the heart of God. And for all of you who knew and loved her, my prayers for your healing, your peace and your consolation. Absolutely beautiful, Ginny. I hope you can share this with all who knew and loved her. Because your words that describe your dear friend so perfectly can make someone cry who never even knew her. Peace to you in such a tough time. What a beautifully written tribute. Thanks for introducing me to her. May God be with you in your grief. What a beautiful tribute to your friend. What an inspiration she is to all of us. Thank you so much for sharing in the midst of your own grief. You are in my prayers. Thanks Ginny. Grief does hurt but never having loved anyone hurts far more! I like Mary’s comment to ‘grief is the price of loving’–‘then, bring it on.’ As I get older, death becomes more real for me and I know more today that death is a part of life and that death is but the finish line when we cross over to our real home in heaven. It does not much console us perhaps when we are active grieving but it has always lifted my heart to know, ‘the best is always yet to come–always!” And, then to strive to live full each moment, savor them when I can, and share the love, pass it on!! Thanks for sharing this Ginny. I know how close you, Scott, Mathew and Luke were to her. These rare individuals who are so transparent and clear in their actions and interactions amaze and inspire me. For those of us who didn’t know Mary well, thank you for helping us (hopefully) pass on a bit of her strength in our own lives. I have known Mary since we were kids Ginny – she has always been a cornerstone for me. Your words are so beautiful and perfect. Thank you so much. Describes our Mary to the ‘T” and brings comfort to remember her wonderful spirit as it was and as it continues to be. Today is Mary’s birthday.. Happy Birthday Mary! We love you!! What a beautiful reflection, Ginny. Thank you for putting into words what many of us are feeling this week. Thank you for sharing your experience of Mary with us, Ginny. What an inspiring love of God’s people she had. May that same love grow in all of us! Ginny your words ring true and are a comfort to read. We will miss Mary’s genuine, beautiful, fun filled friendship immeasurably. Thank you for sharing your feelings and memories with us all. The first image that popped into my mind when I read your memorial to our dear Mary was a fluttering butterfly. I guess I see her metamorphosing into a different figure in God’s light. Although, my interactions with her were very limited and random, I always came away with a good feeling. I will miss her dearly as will many. Thanks for the tribute. Your words aptly describes our dear friend Mary who was truly magnanimous! Thank you for sharing such a heartwarming tribute. “Teach this triple truth to all: A generous heart, kind speech, and a life of service and compassion are the things which renew humanity.” – spiritual verse from Gautama Buddha, principle that Mary followed throughout her life. Wow! Beautiful Ginny. I too will miss you greeting me with “My Erin.” It’s rare to know that a friend loves you so much, but I knew that Mary loved me so dearly from her smile, attention and very loving hugs. I was blessed to witness her teaching her student on several occasions and it was truly inspirational. Thanks Ginny. I’m so sorry for your loss, Ginny, and from reading your description of your wonderful friend Mary, it is all of our loss — even those of us who didn’t know her personally. The world will certainly be a poorer place without her. Keeping you and her especially in my prayers tonight. This is so moving and so true. Thank you, Ginny for putting the essence of Mary into such beautiful words. I know how heartbroken you must be, we all are. It was an honor and a gift from above to have taught with Mary and to have shared such a soulful kinship with her. The next few days will be hard, but I am comforted by all of the beautiful words that Team Mary will be sharing.